"Won't Be Pretty" b/w "Wo Xiang Tanbai" is a limited edition masterpiece (only 500 copies were pressed). Initially recorded during the 2007 Fables sessions, "Won't Be Pretty" stands strong on its own as a solid A-side. Reinforced by Immaculate Machine's signature melodic guitar and keyboard parts alongside soaring vocal harmonies, "Won't Be Pretty" is a gorgeous duet between Brooke Gallupe and Kathryn Calder backed by drummer Luke Kozlowzki's tasteful and energetic arrangments. Now we should probably explain the B-side, which is a little unconventional as "Dear Confessor" (of Fables fame) is in Mandarin! After being teased about their 2006 French EP, Les Un Mais Pas Les Autres by CBC Radio 3 personality Grant Lawrence, the band went back to the studio with their friend, Marie, who translated the song into Mandarin and taught it to them phonetically. Brooke, Kathryn, and Luke then went to the CBC Studios and personally presented the song to Grant and it blew his mind. 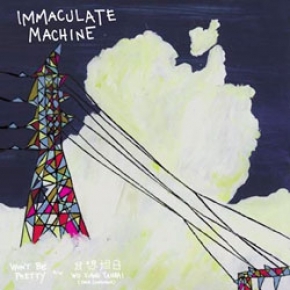 According to Brooke, they don't know precisely what they're saying but those fluent in Mandarin have told them it is quite well done and for the serious Immaculate Machine collectors, the 7" contains a special comic drawn by guitarist/vocalist Brooke Gallupe that tells of the origins of "Wo Xiang Tanbai".